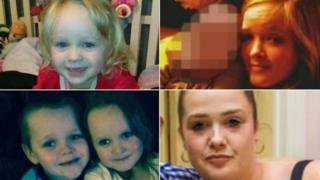 Two men and a woman have appeared in court charged with murdering four children in a house fire in Salford. David Worrall, 25, of no fixed address, Zak Bolland, 23, and Courtney Brierley, 20, both of Worsley, appeared at Manchester Crown Court. They are accused of killing siblings Lia Pearson, three, Lacie, seven, Brandon, eight, and Demi, 15. All three are also accused of arson and the attempted murders of the children's mother Michelle and two 16-year-olds. They were remanded in custody until 9 March for a plea and trial preparation hearing. A trial date was set for 30 April at the same court, with the trial expected to last between three and four weeks. Bolland, of Blackleach Drive, Walkden, and Worrall - both wearing fluorescent yellow and green boiler suits - and Brierley, of Worsley Avenue, Walkden - wearing a grey tracksuit - were flanked by dock officers as the future court dates were decided. At the beginning of the 20-minute hearing, all three gave their full names, dates of birth and nationalities. Worrall smiled as he confirmed his personal details. Demi died at the scene of Monday's blaze on Jackson Street, Walkden. Brandon and Lacie died later in hospital. Lia died in hospital on Wednesday. Michelle Pearson, 35, is in a coma in hospital, unaware of their deaths. Two 16-year-olds, who cannot be named for legal reasons, managed to escape the blaze, which broke out at about 05:00 GMT.